The Charging Bull has become one of the most iconic symbols of New York City and of Wall Street. It was installed in 1989 without authorization from city officials. After failing to convince the city to remove it, The New York Stock Exchange (NYSE) took the matter into their own hands and had a private contractor "steal" the bull and haul it off to Queens. After a public outcry, it was returned and "temporarily" placed in its current location. In Wall Street lingo, if the trend is up, meaning there is optimism and investor confidence, it's a "bull market". If the trend is down, it's a "bear market". 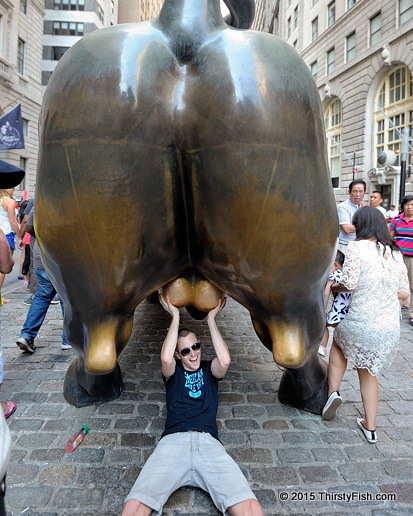 For some reason, people "handle" the bulls-balls for "good luck".